Truly Social Games’ Planet Gold Rush lets you hunt for that elusive yellow metal. As a hardworking miner, you will have access to labor and machinery that will make it easier for you to mine gold and become a proud owner of a gold mine. You can set up a base, build gold washers, warehouses, storage units and several other buildings to expand your mining business. When you are ready, you can take your vehicle to uncharted lands in search of pay dirt. You will have to clear areas, get the pay dirt back to your base and mine gold bars from it. You should traverse the map not only to find pay dirt, but also materials that can be used to upgrade structures. Along with key building upgrade items, you will also discover rocks that contain gold. Just move your truck to sparkling areas and tap them to reveal big rocks. To collect gold, keep tapping a rock until it breaks and disappears. To get materials, tap the cardboard boxes that appear randomly on the map. Oh and did I forget to tell you that you may also find those precious gems while exploring? Besides gold, gems and materials, you will also stumble upon radio towers to help friends in distress. To play tower mini-game, you will have to spend gold. To finish the mini-game, just tap the marker when it is in the green zone. You will have to do this a few times until the task is over and the tower coughs out a reward. Make sure you tap the screen at the right time when the market hits the green zone. If you keep failing, you won’t get any rewards. The radio tower mini-game will offer materials useful for upgrading claim office and other buildings. You really never know what you might discover in the exploration. Can’t find the “upgrade” button when you tap the claim office? Well, you won’t be able to level-up the office building until you reach a certain “Experience level”. You can easily know your experience level by having a look at the number on the upper left corner of the screen. To gain a new experience level, you will need XP, which you can earn by building new structures, upgrading existing structures and exploring the map. Make sure you tap claim office each time you reach a new level to know whether an office upgrade is being unlocked or not. Upgrading buildings in Planet Gold Rush can be a bit tricky. You won’t be able to level up a particular building until your claim office reaches a certain level. For example: If you want to upgrade the Gold Storage to level 2 to increase storage capacity, you will first have to upgrade your claim office to level 4. You will know what building upgrades will be available by tapping the claim office building. Under “Next Level”, you will find 1-2 upgradable buildings with a “+1” underneath them. Such buildings can be upgraded if you have the all required materials in hand. Both Claim office and other buildings need certain materials such as wooden boards and iron to upgrade. You can use blueprints at the machine shop to research new tech. Researching helps improve production, storage and get gold faster. There are several new researches available, such as “Cart Science”, which unlocks an extra cart to facilitate gold collection, “Expedition Science” that lets you increase your truck’s storage capacity so that it can carry more materials and “Train Delivery” that lets you exchange regular materials for more valuable ones. To earn blueprints, you will need to complete orders. To check orders, tap the slider on the left side of the screen. (It’s just underneath the trophy icon.) Next tap an order and press “Start” button to begin a mini-game. These mini-games are fun to play. For example: “Downhill Run” lets you ride a vehicle to collect nuggets by running over them and “Gold Wash” mini-game lets you get an up-close and personal look at how gold is extracted at the wash plant. You get to interact with the machine to break rocks and extract nuggets from them. Try to collect them and fill the container to get blueprints. Once you get the required blueprints, head straight to the Machine Shop to check what research is available and whether you have the required plans. If you are short of plans, you will have to play these mini games again to get them. Surveying dirt-rich lands in Planet Gold Rush lets you gather “pay dirt”, which is then washed at the wash plant to extract gold. While exploring, you will find new pay dirt spots randomly appearing on the map. Just tap a pay dirt and clear clouds, chop trees, and remove shrubs and rocks to clear the area before the timer runs out. Once you get rid of all obstacles before the timer hits zero, you will able to transport pay dirt to your base. Clear everything from clouds to shrubs and it will take time if you manually tap each object, which is why the game provides worker cards that can assist you in clearing obstacles quickly. To survey faster, what you can do is drop multiple cards close to rocks or trees to remove all of them at the same time. If you see two rocks on dirt cut and you have two miner cards shown on the right side of the screen, and then drag those two cards next to each rock to remove them. If you see 2 trees and two rocks on a patch of dirt cut, and if there are 2 miners and 2 woodcutters, then drag all four cards to each rock and tree. 1. Lend a helping hand to your workers in case there are no cards available. 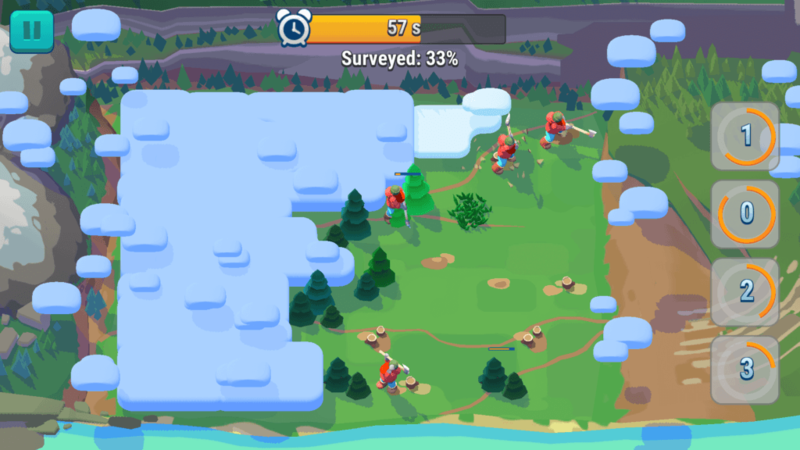 So if there are more trees and all you can see is one woodcutter and three miners, then just drag the woodcutter to a tree and tap to chop the rest of them. 2. You can just drop all miners on the ground so that more woodcutters appear next. However, it will take a few seconds before the next set of cards are shown, so it won’t be good idea to follow this tip if less time is remaining. Manually tapping on shrubs, trees and rocks when no worker card is available while dropping miners on the ground would be a better way to get rid of obstacles quickly. 3. Use items such as chainsaws (cuts trees instantly, thereby saving time) and jackhammers (clears all rocks instantly) in case they appear. You will have to craft these items at the “Survey Shack” building. You will need special materials such as work gloves to craft them. 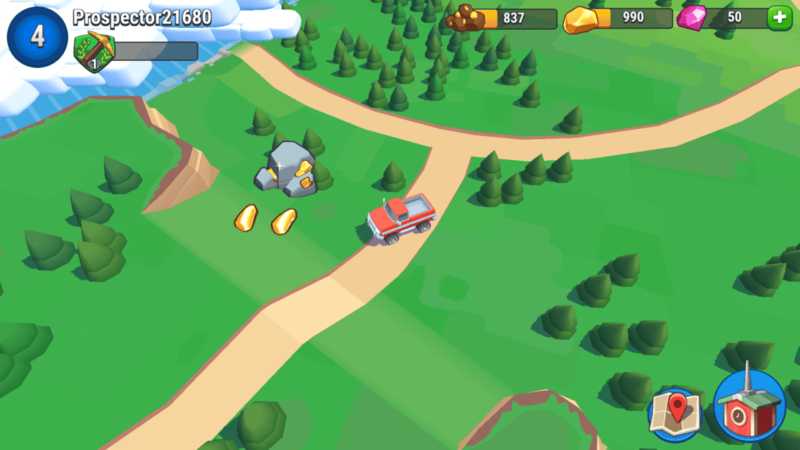 When exploring, you can open new territories by moving your truck under clouds to clear them. Before opening them, you will need to unlock these territories by upgrading your claim office to a certain level. You get rank points when you open territories while exploring. Earn points to reach new ranks, such as “Rookie”, “Miner” and “Eager Miner”. You also get to unlock tow ropes, power tugs and mining drills that will help you get more gold. You can power two or more wash plants by moving them close to a power unit’s range. Long press a wash plant and move it near a power unit. You can also long press a power unit and move it to two or more wash plants. A lightening symbol will appear on each wash plant indicating that they are being powered by a unit. Build the “Helicopter Delivery” to get rare materials in exchange of regular materials. If you have extra regular materials then just go to the helicopter delivery instead of selling them for gold nuggets. Don’t forget to unload materials to your warehouse. Tap your truck soon after you reach your base and drag any materials to your warehouse. You can sell unwanted materials to get some quick gold or just use them at the helicopter or train delivery in exchange for rare materials. Upgrade buildings to facilitate faster gold extraction and storage. Each building has its own unique characteristic and upgrading them will be beneficial to your gold mine in one way or the other. 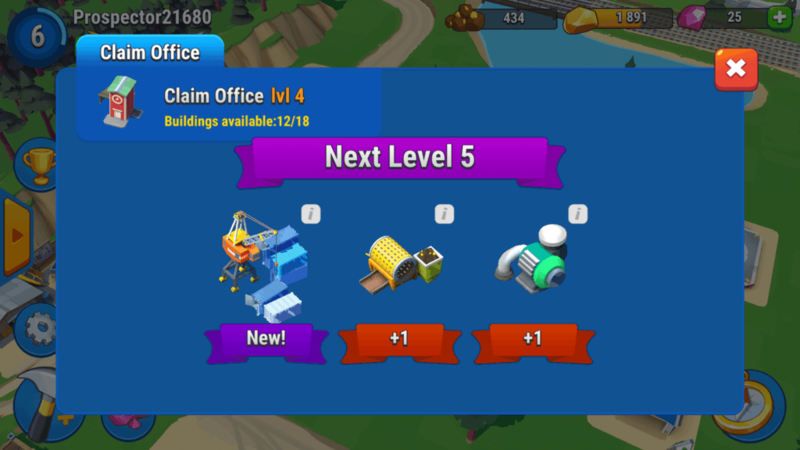 Don’t forget to level up claim office as it’s your door to new buildings and upgrades. You will earn EXP by constructing and upgrading new buildings. Once you reach a new experience level, you will receive gems and rewards. Moreover, your stockpile storage capacity will also increase. The stockpile is where the truck dumps pay dirt. You can earn gems by completing achievements. Use gems to expedite upgrade and construction times. Why do I get a no workers notice when everything to upgrade a building?